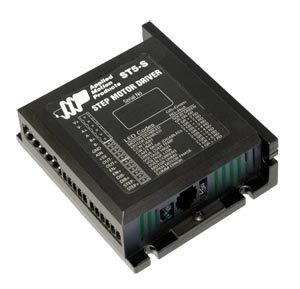 The ST-series high performance stepper drives incorporate advanced features that will derive the highest performance from today’s stepper motors. The Anti-Resonance and Waveform Damping control algorithms make this drive a clear market leader. The "-S" models are step and direction drives, compatible with PLCs which feature high-speed pulse output, such as our ELC-PLC series and OCS XL series. The "-Si" models are stand-alone programmable drives which are programmed with the simple-to-use Si Programmer software. Both the "-S" and "-Si" models can be controlled by sending serial commands in a simple ASCII format, the Si Command Language (SCL). SCL allows for control via serial commands sent from a host device such as a PC or PLC. This permits the user to perform a variety of motion, I/O, and system status tasks in real time via a host serial device. Self Test and Auto Setup: At start-up the drive measures motor parameters, including the resistance and inductance, then uses this information to optimize the system performance. It also compares this information from the last configuration and checks to see if the motor data has changed (this could indicate a fault or system change). The drive can also detect open and short circuits. Anti-resonance: A disadvantage of the step motor is a tendency to "resonate" at some frequency. By entering some system data this natural frequency can be calculated and a damping term entered into the control algorithm. This significantly improves midrange stability and allows higher speeds and more use of the available torque. Command Signal Smoothing: Dynamic smoothing can soften the effect of immediate changes in velocity and direction, making the motion of the motor less jerky. An added advantage is that it can reduce the wear on mechanical components. Intended for use in stand-alone applications, Si (Simple Indexer) Programmer provides quick, out-of-the-box use with an extremely friendly, point-and-click graphical interface that does not require any software programming experience. Once an Si program has been constructed and downloaded to the drive, the program can be executed stand-alone at power-up or from an external trigger. Constructing a program is accomplished through the use of instructions selected in a point-and-click manner. Once an instruction is selected, a "fill in the blanks" format is used to input parameters. Constructing an Si program requires no prior programming experience nor does it require learning a programming language. Si Programmer generates the actual motion control program, based on user selected parameters, thereby eliminating syntax errors. Once created, programs are easily downloaded, uploaded, saved and printed. Si Programmer also provides the capability to control digital inputs and outputs, useful for interfacing with external equipment like PLCs, sensors, end-of-travel switches, and more. Si Programmer has found success in all types of applications, from simple linear actuator applications to complete machine control with operator interface applications. Q Programmer is a text-based single-axis motion control software for "Plus", "Q", and "IP" model stepper drives. The software allows users to create sophisticated and functional programs that Plus, Q, and IP drives can run stand-alone. The commands available in the Q programming environment consist of commands for controlling motion, inputs and outputs, drive configuration and status, as well as math operations, register manipulation, conditional programming, and multi-tasking. Unlike the Si Programmer, some programming experience is recommended to use Q Programmer. Note: Programming/serial configuration cable included. Programming/configuration software is a free download; click on "Software" icon below the picture. To see torque-speed curves for recommended motors, click on "Specs" above.